Circle of Blue intern Jinah Park summarizes the first three weeks of spring at the Traverse City office. Circle of Blue’s circles of blue! 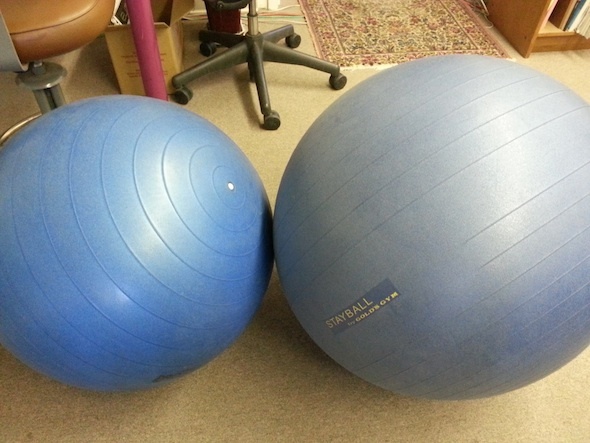 I like to bounce on these when sitting on a regular office chair feels dull. Click image to enlarge. This is the third week of my internship with Circle of Blue. I am a student at Northwestern University’s Medill School of Journalism, and I’ve chosen to spend the last quarter of my junior year at Circle of Blue as part of my Journalism Residency requirement. Lydia Belanger: Intern summer of 2012, currently a junior at Medill — Lydia is studying journalism, media, and integrated marketing communications at Northwestern University. Aubrey Blanche: JR from June – August 2012, Medill graduate in 2012. Aubrey #2 is now a PhD candidate studying Political Science at Stanford University. Trevor Seela: JR from April – June 2010, Medill graduate in 2011. Trevor is now a visual information specialist at the Captain James A. Lovell Federal Health Care Center. Nadya Ivanova: JR from April – June 2009, Medill graduate in 2010 — Nadya stayed on with the Circle of Blue team as a reporter until August 2012, when she began a dual Master’s degree program in Paris studying International Security and International Political Economy. Aaron Jaffe: Intern from May through August 2008, Medill graduate in 2012 — Aaron has been working on various projects for Circle of Blue since he was in high school. Aaron is now an associate at SustainAbility. J. Carl Ganter: Medill graduate in 1987 — Carl co-founded Circle of Blue in 2002 with his wife Eileen. I have been enjoying every day here, and I am amazed at the variety of work I have been able to touch on. For the past three weeks, I have been contributing to Circle of Blue’s daily Twitter feed and I write The Stream on Tuesdays. Pouring through the flood of news and searching for the main trends has provided a wonderful learning experience — I now have a better understanding of water issues and a much better eye for #waternews. The day I arrived at Circle of Blue, I was also handed the assignment of organizing data that will be used in Choke Point: India, which will be publishing in the next few weeks. The data that I collected, organized, and analyzed will be used to create an infographic on the coal-water nexus in southeastern India. Circle of Blue’s Global Choke Point series is based on a model of reporting that was recognized by the Rockefeller Foundation in 2012, and the series has produced groundbreaking reports in China and the United States, so I am thrilled to be part of the India chapter. Developing infographics are also a part of my responsibility. The Action Figures series is one part: I write and edit biographies of people we’ve interviewed, and then I design banner photos based on the interviews. I am also building interactive graphics for my colleague Brett Walton’s fourth feature on the price of water in the United States, a series he does annually and which was recently mentioned in Popular Mechanics. The Price of Water 2012, The Price of Water 2011, and The Price of Water 2010 are stories that have been consistently ranking as the highest viewed on Circle of Blue’s site, and I am excited to find out what I can add to this year’s water rate story. A preview of an upcoming installment in the Action Figures series that I’ve been working on. Click image to enlarge. Another perk of working with Circle of Blue is the adorable city where it is located. I admit I was worried when I first learned I was coming to Traverse City. I had never heard of the place, and I knew not a single person here. But I am happy to say that I have fallen in love with the city (yes, cliché). In a few weeks, other interns will be joining me. The weather is starting to warm up, and I am looking forward to the rest of my stay here that I am sure will be filled with warm sand dunes and breezy walks by the lake. Want to know what it’s like to intern with Circle of Blue? Email me at circleofblue.org/contact or comment below. is an intern for Circle of Blue based out of Traverse City, Michigan. She is a student at Northwestern University Medill School of Journalism.